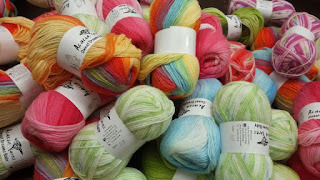 Yarn and Fiber Happenings: Mystery Hand-Dying Goddess at Yarn and Fiber Company on Sept 15th! Mystery Hand-Dying Goddess at Yarn and Fiber Company on Sept 15th! Cheryl Potter from Cherry Tree Hill is coming this Saturday, September 15 to teach a hand-dye class at the shop! But there is a secret - she is bringing with her a mystery guest - (don't even ask, she won't tell me either!) The mystery guest owns her own hand-dying company and is a friend of Cheryl's. Those are my only hints - Cheryls own words were - You won't be dissappointed! She is very excited about bringing her friend and the two of them will be teaching the class together - wow! How exciting! There are a couple of spots available if you would like to join us - give us a ring and we will put you on the list - 603-898-5059. Here are some pictures of Aprils hand-dye class! Awesome! Can't wait to post the pictures for this one!